The men and youths in this photo didn't know it when it was taken but they were to bear the brunt of two World Wars. Those who survived would have been in their fifties and sixties when I started swimming here. They are gathered in the shallow end where, if I remember correctly, there was a short flight of step in the corner. A simple diving platform can be seen on the left and further to the left, in the middle of the end wall was a foot bath and a long flight of concrete steps leading up to the open air pool, which was a converted reservoir. At the other end was the high diving board which reached almost to the roof. The changing cubicles, as can be seen behind the man with the towel, were half doors and pretty cramped. We went as often as we could afford and sometimes with the school for swimming lessons, even though nearly everyone I knew could swim already. 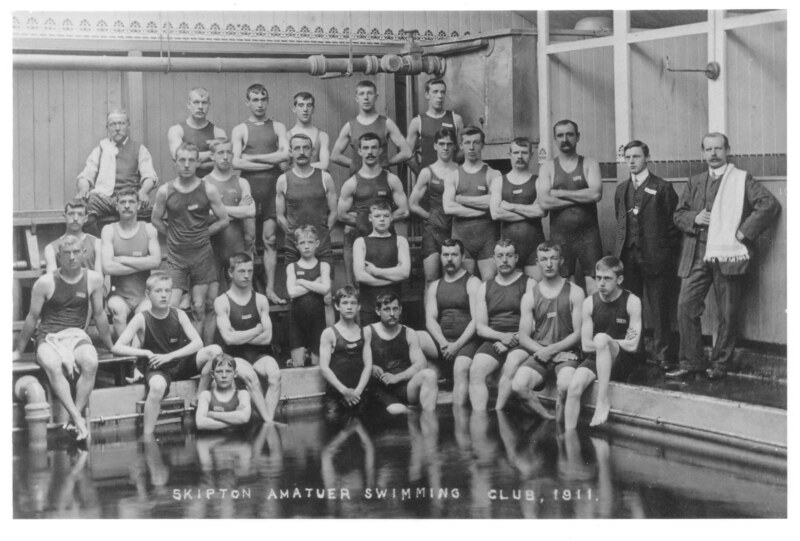 At these baths I learnt to swim, I would have been about 5 (1953) we wnet as much as we could afford to go during the summer holidays not sure but I think it cost us 3d the shallow end was 3ft 6ins and the deep end 5ft 4ins.